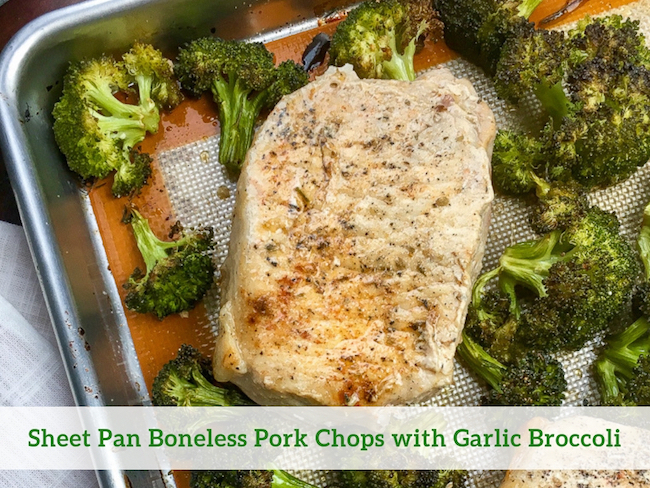 Sheet Pan Boneless Pork Chops with Garlic Broccoli is a simple yet flavorful meal that’s comes together easily on one sheet pan. 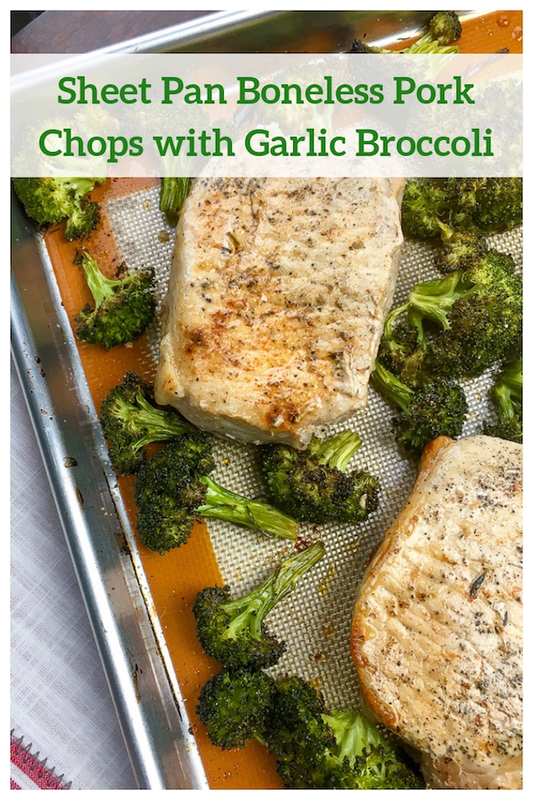 This tasty recipe works best on a single sheet pan because the juice and seasonings from the pork chops adds a lot of incredible flavor to the simply prepared roasted garlic broccoli. If necessary, use a larger three-quarter size sheet pan to allow enough room for the broccoli to be spread out in a single layer without overcrowding. Line a large, rimmed baking sheet with parchment paper or a Silpat baking mat. Place the pork chops on the prepared baking sheet and drizzle each chop with some olive oil (approximately 2 tablespoons for all 6 pork chops). Place the smoked paprika, onion powder, garlic powder, and 1 teaspoon Italian seasoning into a large glass mixing bowl and combine. Rub the spice mixture on both sides of each pork chop and return to the prepared baking sheet. Season generously with salt and black pepper, to taste. Add the fresh broccoli florets to the same mixing bowl and drizzle with remaining olive oil. Add the remaining Italian seasoning and minced garlic to the bowl and toss to combine. Season with salt and black pepper, to taste. Arrange the seasoned broccoli on baking sheet around the pork chops, spreading into a single layer. Place the baking sheet into the oven and roast for 23-28 minutes, turning the pork chops and stirring the broccoli once, or until the pork is completely cooked through and the broccoli is nicely browned. Actual cooking time will vary based on a number of factors, including internal starting temperature, individual oven variations, size and thickness of the meat, what else is in the oven while cooking, etc… Check the temperature of the meat with a thermometer. The minimum safe cooking temperature for fresh pork is 145°F. 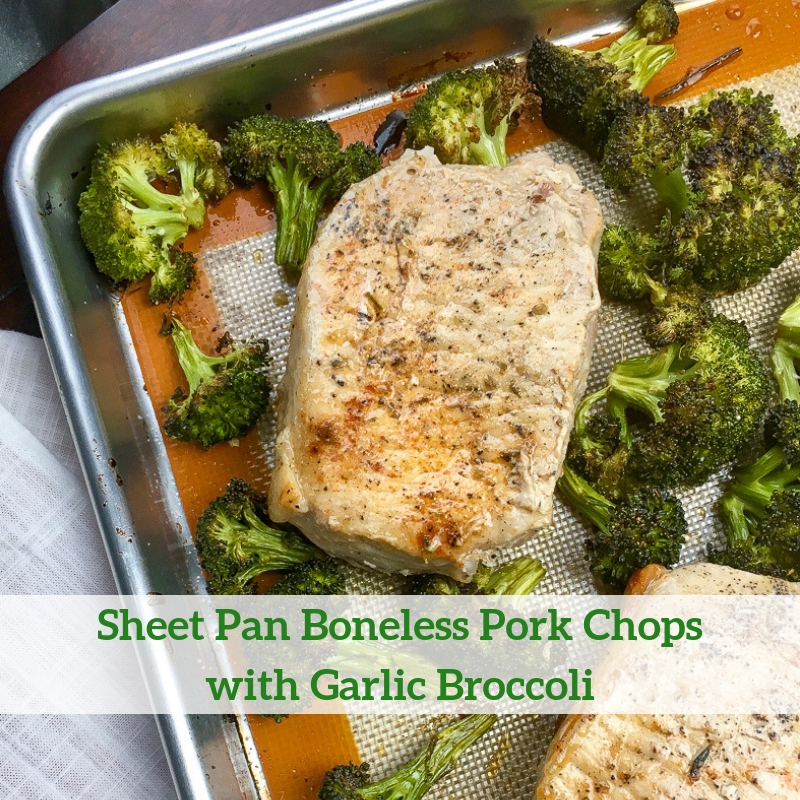 Remove the sheet pan from the oven and transfer the pork chops and broccoli to a serving platter. Cover loosely and allow the pork chops to rest for 5-10 minutes before serving. Preheat the oven to 400°F. 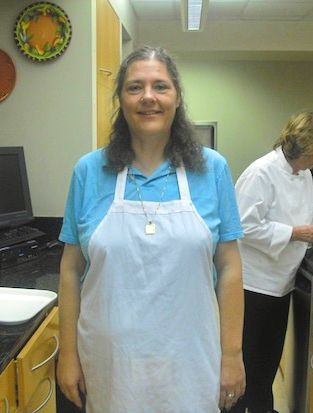 Line a large, rimmed baking sheet with parchment paper or a Silpat baking mat. Place the pork chops on the prepared baking sheet and drizzle each chop with some olive oil (approximately 2 tablespoons for all 6 pork chops). Place the smoked paprika, onion powder, garlic powder, and 1 teaspoon Italian seasoning into a large glass mixing bowl and combine. Rub the spice mixture on both sides of each pork chop and return to the prepared baking sheet. Season generously with salt and black pepper, to taste. Add the fresh broccoli florets to the same mixing bowl and drizzle with remaining olive oil. Add the remaining Italian seasoning and minced garlic to the bowl and toss to combine. Season with salt and black pepper, to taste. Arrange the seasoned broccoli on baking sheet around the pork chops, spreading into a single layer. Place the baking sheet into the oven and roast for 23-28 minutes, turning the pork chops and stirring the broccoli once, or until the pork is completely cooked through and the broccoli is nicely browned. Actual cooking time will vary based on a number of factors, including internal starting temperature, individual oven variations, size and thickness of the meat, what else is in the oven while cooking, etc... Check the temperature of the meat with a thermometer. The minimum safe cooking temperature for fresh pork is 145°F. Remove the sheet pan from the oven and transfer the pork chops and broccoli to a serving platter. Cover loosely and allow the pork chops to rest for 5-10 minutes before serving. Serve and enjoy!